Who knew there would be so much involved in choosing hardware for window treatments. Well, we did, that's why we're here! If you've been in the store you've probably noticed the drapery panel hanging by the counter. It changes with the seasons and the store inventory. If you haven't looked closely, you're missing this swing arm iron hardware from Helser Brothers. We've mentioned them several times, and their great service is just one of the reasons. A swing arm rod would work well in a doorway as a room divider! Another great rod they make is this twist style. We've used it for a cafe curtain and as an inside mounted rod. Notice the socket brackets that we used for this deep set window. Not everyone has windows with this much depth, so we can use a brackets that is even smaller, but still allows the rod to be mounted inside the frame. Many homes still require an outside mount for cafe curtains, and we just request that the brackets be made with a shallow return (keeps the rod closer to the window).
. You can barely see the white rod and finial for this breakfast room, but that was the point. We only wanted to blend in with the white trim and leave the fabrics on these valances as the highlight of the room. They actually had a lot of detail not visible in the pictures: pleated blue ribbon trim on the bottom, yellow cording across the top, and yellow covered buttons at each pleat. And yet another sample rod in the store, also made by Helser Brothers. This is from their new line, Artefice. Notice the square rings and rod. We had this made especially for the shop so we could mount it like the swing-arm rod: pointing away from the wall. Typically, this rod is mounted between two brackets, like most others. This is an example of the custom work we are able to request from our hardware vendors. This close-up shows the glass knobs used to hang these over 100" panels. Actually, they are hanging from the posts that were "tooled" to support these drapery panels. It was necessary that they had a 5.5" return (space from the wall to the front of the panels). These were to go on each side of a large window that was already dressed with outside mounted Silhouettes. They were hung outside the trim due to the framing of the windows. A Silhouette has a 3.5" projection itself, so the panels had to hang free of the shades. A very sturdy post was made and powder-coated to match the bronze colors on the hardware already in the bedroom. Very heavy duty wall anchors had to be used because we mounted these above the header! Not visible to you are the soffits on either side of the window! Do you think we had enough hoops to jump through on this job!? Hooray for the installs that don't require custom work ahead of time, but we're ready when we get to the home. 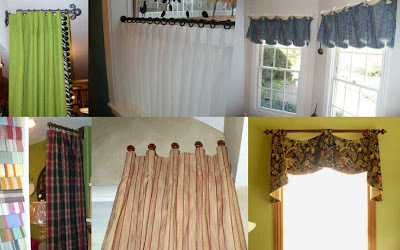 This otherwise simple window treatment did require that the brackets were placed so that enough rod space was available on each end to support the tabbed jabots that was part of this valance. The stained wood rod/finials/brackets was chosen to coordinate with the desk she purchased from us for use in this home office. The client had also purchased a chair from the Justice furniture line, and we were able to order extra yardage for the window treatment. Let Madison Lane Interiors tell you the "what, where and why" on your next window challenge.